This document's target is to explain in detail how the IoTAgent interacts with the Context Broker in all the possible IoT Scenarios that are supported by this library. This document has two sections. In the first section, all the interaction models will be explained theoretically with sequence diagrams, including the advantages and disadvantages of each one of them for different scenarios. The second section will show examples of all those interactions, using command-line tools available in most OSs, like netcat and curl. Headers for the service and subservice. A service "workshop" with subservice "/iota2ngsi" will be used. A Unix-line command line interpreter. All the workshop will take place in the command line, making use of different command-line tools to simulate the different interactions. Curl command-line HTTP client should be installed. Netcat network utility should be installed. An accesible IoT Platform with the following configured components: Keystone, Steelskin PEP and Orion Context Broker. Basic knowledge of the NGSI model and HTTP interfaces. Inside the FIWARE Architecture, the IoT Agents work as protocol translation gateways, used to fill the gap between traffic sent and received on the South Port (typically lightweight protocols aimed to constrained devices) and traffic sent and received on the North Port which uses the standard NGSI protocol to communicate FIWARE components. This translation process can be customized by the user with provisioning instructions, using the Device Provisioning APIs. In this document, we are going to focus on the NGSI interactions between the IoTAgents and the Context Broker, but the three actors will appear eventually in sequence diagrams, as all of them take part at some point in the interactions. 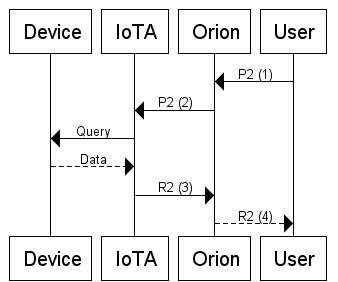 All the interactions between the IoTAgents and the Context Broker are standard NGSI, as described in the Fiware Orion Context Broker manual. The general purpose of the interactions between both components is: * To map device information coming to the IoTA to NGSI entities in the Context Broker. * To ask for device data from the Context Broker through the Context Provider mechanism. * To send commands to devices based on modifications of the device entity in the Context Broker. This interactions can be mapped to three different scenarios (that will be detailed in further sections). There are only two kinds of possible data interactions between the IoTAgents and the Context Broker: the queryContext and updateContext interactions described in NGSIv10. Lots of examples can be found in the Fiware Orion Context Broker manual but this section shows some examples of each one of them. All the interactions have been labeled with a two letter acronym for its use in the subsequent explanations. No other type of payload can be issued in any interaction between this two components. The following subsections will show examples of each one of them, with a brief explanation. Refer to the linked NGSI documentation for more details. This payload is associated to an update operation (POST /v1/updateContext). A contextElements attribute that contains the data that will be updated in the target entity in the attributes attribute, along with the information needed to identify the target entity id and type attributes. This attribute is an array, so a single updateContext operation can be used to update. An updateAction indicating the type of update: if this attribute has the value "APPEND" the appropriate entity and attributes will be created if the don't exist; if the value is "UPDATE", an error will be thrown if the target resources don't exist. As the example shows, the response to an updateContext is basically an empty copy of the request payload, along with an statusCode attribute indicating if the operation has succeeded (or a possible error). Application level errors can be specified for each entity in this payload. This payload is associate to a query operation (POST /v1/queryContext). The list of target entities whose information is going to be retrieved. The list of attributes of those entities that will be retrieved. In this case, the response to the QueryContext is a list of responses, one for each requested entity, indicating whether the information has been retrieved successfully (in the statusCode field) and the requested Context information in the ContextElement attribute. "reasonPhrase": "No context element registrations found"
This special payload can be used to specify general errors with the request, that are not associated to any particular Context Element, but with the request as a whole. In this scenario, the interaction is started by the device, that is going to actively send a piece of data to the platform. When the IoTAgent receives the data, it sends it to the Context Broker through a P1 request. The Context Broker then stores that information locally and returns a R1 indicating the request has succeeded. This interaction is 100% synchronous from the perspective of the device (all the interaction happens through a single HTTP request and response in the same socket). This scenario leaves all the data locally stored in the Context Broker, so the user can query them using the standard NGSI APIs offered by the Context Broker (including subscriptions). This data queries are completely separate from the updating process, and can occur at any time (they are to completely different process). This scenario requires that the attributes that are going to be requested are marked as provided by the IoT Agent, through a registration process (NGSIv9). Examples of this registration process will be provided in the practical section of this document. It's worth mentioning that Orion Context Broker will not store locally any data about attributes registered as provided by a Context Provider; all the queries and updates to registered attributes will be redirected to their Context Providers. This interaction scenario is started by the User, that makes a query request, P2, to the Context Broker (1). The later, detecting a Context Provider for the attribute, will forward the exact same query, P2, to the IoTAgent (2). The IoTA will then ask the devices for the required information (or it will retrieve it from its own database in case it stores a copy of the data). With that information, it will answer with a R2 response payload to the Context Broker, as the HTTP answer for the original Context Broker request (3). This R2 response payload is the one containing all the information requested by the User in the original request. Once it has all the information, the Context Broker will return the same R2 request to the User, as the response to the original HTTP request (and thus, in the same HTTP socket that initiated the request) (4). This scenario is 100% synchronous from the perspective of the User (and also 100% synchronous from the perspective of the Context Broker). This scenario can be used for both updates and queries. The only difference between both uses would be the set of actions to use: updateContext actions for the update (and thus, P1 and R1 payloads); and queryContext actions for the queries (and thus P2 and R2 payloads). An attribute will be used as the input attribute (the attribute registered in the Context Provider). 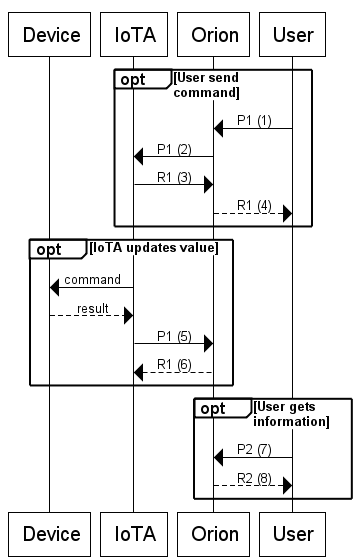 This input attribute can be thought of as a command issued to the IoTAgent (from here the name of the scenario) whose value is the set of arguments of the command. Only updateContext operations will be used to interact with this attributes. Another attribute will be used as the result attribute. This attribute will be updated from the IoTAgent, and its value stored in the Context Broker. This attribute will contain the result of the command (this result can be information in case the command was a "information retrieval" command or the result of an action if it was an "actuator command"). Typically, the name of this attribute will be the same of the input attribute, with an additional sufix (_info). Another attribute with the same characteristics as the later will be used to indicate whether the command has ended successfully or whether an error has been reported. In this scenario, the interaction is also initiated by the User. The user starts the scenario by sending an update request P1 to the Context Broker, to the input attribute (1). The Context Broker redirects this same payload to the Context Provider of the attribute (the IoTAgent) (2). The IoTA immediately answers the request by issuing an R1 (3). This response is not the final answer to the query, and does not contain any usefull data apart from the status Code. Answering with a 200 code to this request implies that the IoTAgent has accepted the command, but is yet to process it; once the IoTA has processed the command, it will update the information. The Context Broker then forwards this same response to teh User who started the interactions and all HTTP connections are closed (4). This part of the scenario is 100% synchronous for the User, but does not provide him with the data he queried; it just initiates the asynchronous background process. At some point in the future, the IoTAgent gets the data it needs to process the command. Then, it starts a new interaction with the Context Broker, by sending a P1 update request to the Context Broker (5). This P1 payload is the one containing all the information requested by the user. That information will be updated in the result attribute and no reference to the input attribute is made in this request. The Context Broker returns a R1 answer to the IoTA, ending the HTTP interaction (6). This scenario leaves all the data locally stored in the Context Broker, so the user can query them using the standard NGSI APIs offered by the Context Broker (as shown in the (7) and (8) requests in the diagram). This data queries are completely separate from the updating process, and can occur at any time (they are to completely different process). Scenario 1: this scenario is aimed to interactions actively started by the Device. Scenario 2: designed for interactions started by the User that are fast enough to be performed synchronously (within the time of an HTTP timeout). Scenario 3: designed for interactions started by the User that are too slow to be performed synchrounously. The following sections will show a series of examples of all the interactions that can be found in each scenario. Initial requests are shown as full Curl commands (that can be used to reproduce the example). Redirections from the Context Broker are shown as HTTP Requests (the whole request as it is sent via TCP sockets is shown). For responses, just the status code and the response payload are shown. Be sure to understand how each scenario works (as shown in the theory section) before reproducing the interactions. Along this document, IP addresses and passwords will be concealed. Substitute the concealed passwords by your own. A postman collection is available alongside this document to help in reproducing this examples. It can be found here. 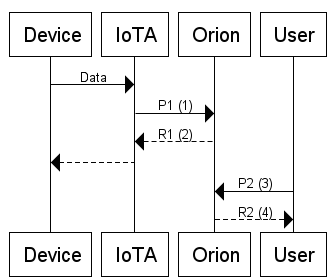 This scenario assumes that the IoTAgent is connected to an Orion Context Broker secured by a Steelskin PEP, so every request to the Context Broker should be authenticated. The User token that needs to be used in the authorization header will be returned in the headers section, in the X-Subject-Token. This value should be appended in the X-Auth-Token header for all the requests made to the Context Broker (as it will be seen in the examples). This will confirm that the attribute temperature has been stored locally in the Context Broker, and that its value can be queried. "details": "action: UPDATE - entity: [Dev0001, device] - offending attribute: UnexistentAttribute"
It is worth mentioning that the Context Broker will reply with a 200 OK status code, as in standard NGSI, the HTTP codes refer to transport protocol level errors, while the status codes inside of a payload give information about the application level protocol. The example shows an error updating an unexistent attribute (due to the use of UPDATE instead of APPEND). "reasonPhrase": "No context element found"
Different kinds of errors can return their information in different formats, so NGSI implementations should check for the existence of both. This ID can be used to update the registration in the future. The registration of the attributes is performed once in the lifetime of the Device. Being fully synchronous, errors for scenario 2 follow the same patterns as for scenario 1. If the IoTAgent returns an error, that error must follow the NGSI payloads described in the Scenario 1 error defined above. The registration of the commands is performed once in the lifetime of the Device. This response just indicates that the IoT Agent has received the command successfully, and gives no information about the requested information or command execution. At this point, the command has been issued to the IoTAgent and the User doesn't still know what the result of its request will be. This update does not modify the original command attribute, but two auxiliary attributes, that are not provided by the IoT Agent (usually, those attributes has the same name as the command, with an added suffix). This operation stores the retrieved values locally in the Context Broker, so it can be retrieved with standard NGSI mechanisms. "value": "The switch could not be switched due to the following error: switch blocked"
The User will acknowledge the error the next time he queries the Context Broker for information about the command.